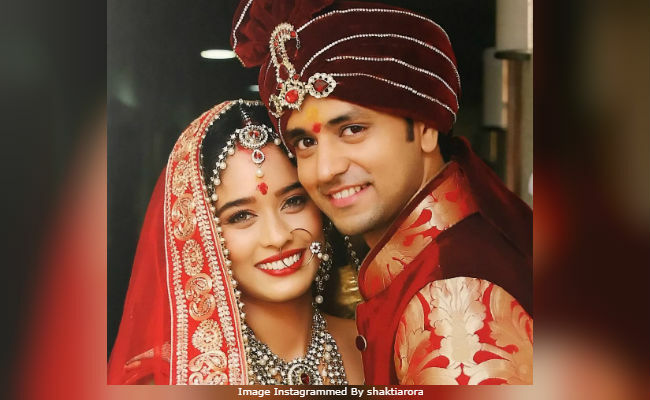 Television actors Shakti Arora and Neha Saxena, who co-starred together in Tere Liye, got married recently and the couple announced the big news on Instagram with a picture from their wedding. "Together is a wonderful place to be," Shakti captioned his post, adding a heart emoticon while Neha wrote, "A dream you dream alone is only a dream. A dream you dream together is reality." The bride and the groom complemented each other in red. Neha looked beautiful in a red lehenga with golden border and kundan jewellery and Shakti wore a sherwani. Indian Express reports that Shakti and Neha got married on April 6 in an extremely private ceremony. See Shakti Arora and Neha Saxena's wedding picture here. "It was a very hush-hush affair with only close family and friends invited. Both Shakti and Neha are not someone who wanted to make it a public event. The families were ecstatic when they informed them about finally taking the plunge. They will soon be travelling to Norway for their honeymoon, post which both want to focus on their respective careers," a source told Indian Express. Shakti Arora and Neha Saxena first met on the sets of 2010's Tere Liye and they had got engaged in 2014. Last year, their break-up reports also featured in headlines. Shakti and Neha had participated in the couple dance reality show Nach Baliye 7. He was also one of the contestants of Jhalak Dikhhla Jaa 9. Shakti is best-known for Meri Aashiqui Tumse Hi and other shows like Gyaan Guru, Gumraah, MTV Webbed and Pyaar Tune Kya Kiya. Besides, Tere Liye, Neha Saxena has appeared on the show Sajan Ghar Jaana Hai. Congratulations, Shakti Arora and Neha Saxena.